When the weather is beautiful, it’s natural to want to invite your gues ts to step outside so you can entertain in your backyard. 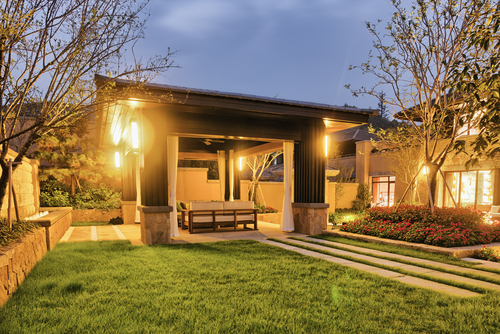 Designers often refer to this area as an outdoor living space that needs as much attention as the inside of your home. Here are three landscaping ideas to consider that will give you and your guests hours of enjoyment. A patio with a cooking space or outdoor fireplace provides the opportunity to cook and serve great food to family and friends. Eating while enjoying the peaceful beauty of your backyard is a relaxing treat. Fire pits or outdoor fireplaces give off warmth in the cool of the evening and give everyone the chance to make s’mores. Providing plenty of seating, whether permanent benches or lawn furniture, encourages relaxation and enjoying the view. Making the best of your backyard’s natural beauty by caring for your landscaping is another way to entertain visitors. Trees should be groomed, bushes trimmed, the grass kept in a healthy state. Planning and planting flowers and flowering plants adds beauty and something interesting for you to look at. Pest control is also important. Even if you plan a natural landscape, it should be kept free of dead plants, and it takes maintenance. You can choose to plant things that attract butterflies and birds. It is fun to sit out in the backyard and wait to see what kind of wildlife will show up.